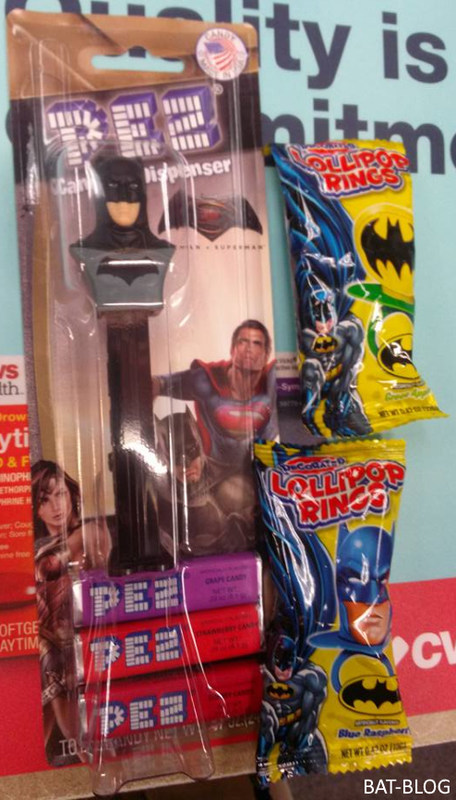 BAT - BLOG : BATMAN TOYS and COLLECTIBLES: #BATMAN PEZ CANDY Dispenser and LOLLIPOP RINGS Spotted at CVS Stores! WOO HOO! Here's a quick post to share this wonderful photo sent in by a BAT-BLOG Fan who recently hit his local CVS Drug Store and came across these fun new "Batman" items!! First up, here's an individually-packaged PEZ CANDY Dispenser of BATMAN (They also made ones of Superman and Wonder Woman) and then, these 2 different packages of BATMAN Lollipop Rings, YUMMY! !